Automatically move all of a contact’s opportunities, or any opportunity selected through filters, restrictions, and ordering, to a specified stage. 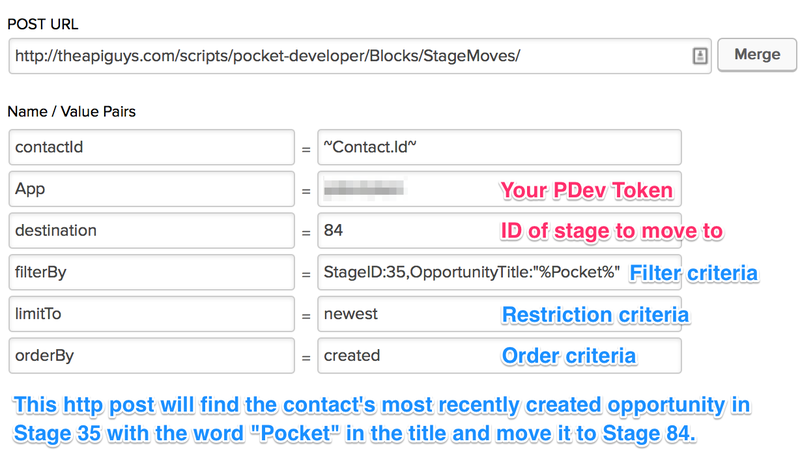 All opportunities found will be set to this specified destination StageID. Add optional parameters to limit the search to specific opportunities (recommended). Filters can be combined to further narrow down a contact’s opportunities. Use % as a wildcard in searches. Opportunity filterBy results can be limited by using the values of ‘oldest’/’first’ or ‘newest’/’last’ to limit the result to a single opportunity. Get more information about filters and directives.